For this week I kept up the routine of washing my face with the Apricot Scrub, but I dropped the per-shave gel. After a weeks worth of shaves I can honestly say I didn’t miss it. This week we say farewell to the Tiki’s Set Sail. Tuesday I had finished it up. Woot! More space in my den! Did not shave on Wednesday or Saturday due to lack of time. 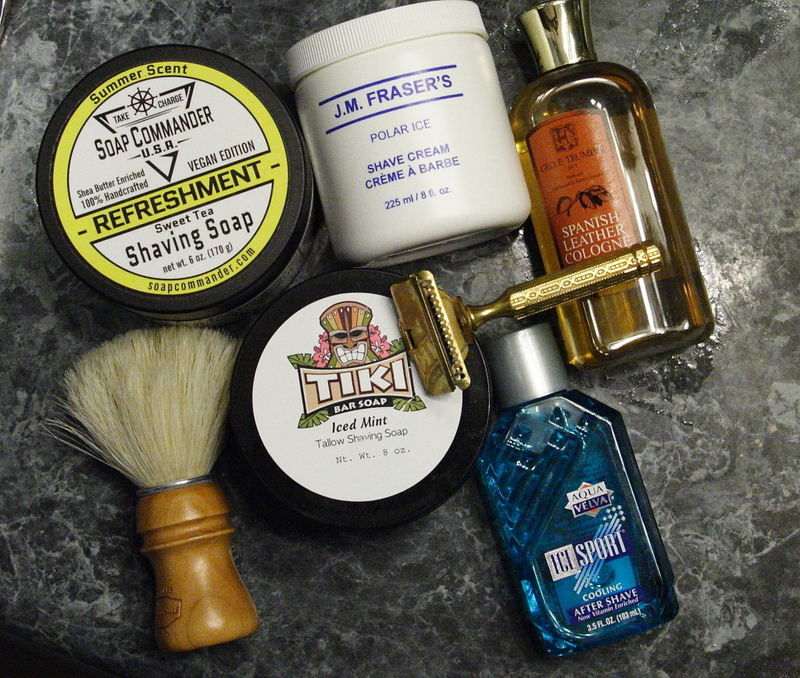 Thursday saw me use the Soap Commander -Refreshment and Friday was a J. M. Fraser’s – Polar Ice day. The aftershave of choice was the Aqua Velva – Ice Sport. I’ve become quite fond of this scent but the menthol was lacking so I added a couple of menthol crystals to it to liven it up a bit. It appears I need to add a few more. Today, Sunday I went with the Tiki – Iced Mint. This is the tallow version which I prefer over the vegan. Using the Semogue Owners Club brush (which I have used all week) I got a much thicker, faster lather than the Set Sail. For this morning I did both my head and the face. I had quite a bit of hair up top and I frequently had to open the Gem and rinse it out. I should state that the final shave up top was the 8th shave for the Gem coated stainless blade. I would say it’s longevity is due to me only doing 1 or 2 passes. I haven’t tossed it yet, but tomorrow morning it might need be. I normally toss blades after a head shave. Spanish Leather cologne to finish it all off. Lately I haven’t felt too gung-ho about taking photos or recording what I am using. I don’t get a lot of views or feedback. Been thinking about just skipping the photo all together, leave some of the Facebook groups and just posting a small descript to the small handful I stay with. The only thing is sometimes I get a really good photo and I like to look back on it a few months later. I dunno.